In celebration of Thanksgiving, we're sharing our 7 Wines of Thanks. "Wine Mic Monday" and "The Hit List" will resume next week. Happy Thanksgiving Winelovers! Don't forget to capture your wine experiences using the VAULT29 app. This rose from Columbia Valley, Washington is a project collaboration between self-taught winemaker/Food & Wine Magazine “2009 Winemaker of the Year”, Charles Smith (K Vintners, Charles Smith Wines) and Charles Bieler (Three Thieves, BIELER Père et Fils, Gotham Project). You can still find this wine at your local Whole Foods or wine shop. Wine Enthusiast ”2014 Top Buy"
In August, we made a trip to Calistoga to taste the wines at Lava Vine. The crowd pleaser was the light to medium body Grenache. This wine experience is unlike any other we’ve had. Winemakers went from pouring wines to playing the guitar, while the winelovers tasted, paired, laughed and sung along. The best part about it? Dogs are welcome too! Amor Fati means “Love your fate which is in fact your life”. The 2012 Pinot Noir was sourced from Murmur Ranch Vineyard located in the southern area of Santa Maria Valley, close to the ocean. Rob Murray planted the “virgin land” vineyard himself when he purchased it in 2007. Be on the lookout for Tooth & Nail winery opening this November in Paso where Amor Fati wines will be poured! We came across this red blend (65% zinfandel) from Paso Robles at a winetasting event aimed to help small family-owned wineries. No Pasa Nada is just that - small and boutique - producing approximately 900 cases winery-wide. You can only get this wine directly from the winery. 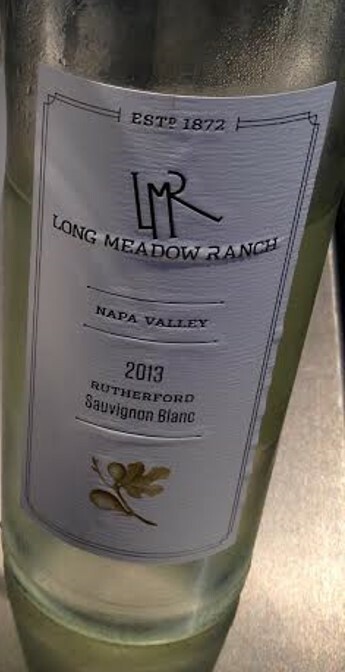 This wine is the ninth vintage of sauv blanc from LMR’s Rutherford Estate in Napa Valley. The nose alone draws you in with the fruitiest of fruit flavors, like melon and pineapple. Clean, crisp, and refreshing is what comes to mind when describing this wine. At $20 per bottle, it goes perfect with pizza, crab cakes and bruschetta. When visiting the winery you must dine at Farmstead, their restaurant on the property – It’s divine! When dining at Bottega, in Yountville, our friends insisted we drink a 2006 Maybach Family “Materium”. This highly acclaimed Weitz Vineyard Oakville Cabernet received 96pts from Wine Spectator and did not disappoint. You may find it on the wine lists of several fine dining restaurants in California, like Press, Gary Denko, and Jardiniere, as well as Per Se, Grammercy Tavern, Jean Georges, and others in NYC. It’s definitely a memorable experience! An amazing sunny day sipper from Edna Valley (Central Coast). We were so fortunate to experience this wine at Ad Hoc, a Thomas Keller restaurant in Yountville, CA. The set menu, which changes daily, is four-courses of American “home-like” foods which can be paired with wine, if you so wish to spend a little more money. This Tatomer Gruner Veltliner was paired with thyme biscuits, local honey, and goat cheese. Talk about party-in-your-mouth! !